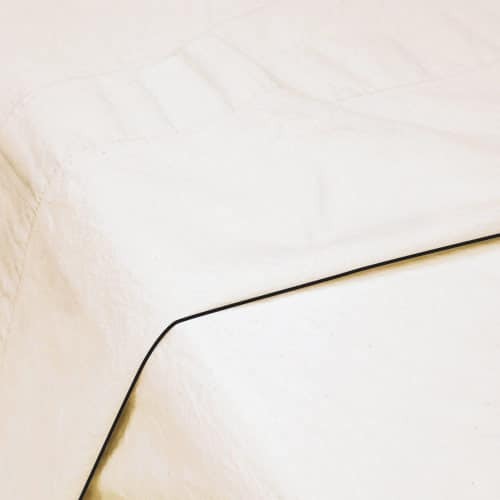 Flat sheets are finished with a slightly larger hem along the top edge than the bottom. You can find a lot more information about them in the tabs below. Just like everything at bed these are all sold individually so you can mix and match colours. We don’t make a double flat sheet because they would only be a wee bit narrower than a queen. All measurements are approximate. Single flat sheets are 56 inches (142cm) across so there are no seams in our single flat sheets. Because double beds are only 6 inches (15cm) narrower than queen beds, we do not make a specifically double flat sheet. A queen flat sheet is about 92 inches (234cm) across and therefore easily covers a double bed. The sheet is made with a centre panel of about 56 inches (142cm) and two side panels of 18 inches (46cm) panels each. The seams fall along the side of the mattress, running right along the edge of the bed. This is mirrored on the other side of the bed. A queen flat sheet is about 92 inches (234cm) across and is made with a centre panel of about 56 inches (142cm) and two side panels of 18 inches (46cm) panels each. The seams fall along the side of the mattress, running very close to the edge of the bed. This is mirrored on the other side of the bed. To make our king sized items we use a special supply of 88 inch (223cm) wide fabric. A king flat sheet is about 110 inches (279cm) across and is made with a centre panel of about 78 inches (198cm) and two side panels of 16 inches (40cm) panels each. The seams fall along the side of the mattress, running very close to the edge of the bed. This is mirrored on the other side of the bed.